SavvyCurls.com has launched a Kickstarter campaign for their new Mega Glam Single or Multi-band Thermal Curling Hair Wrap to provide women a comfortable no-heat option for gorgeous curls. Collage of Hair Curls created by Savvy Curls! Thanks for the headband! I can totally manage curling my hair this way, I'm so excited there is something out there like this that is so easy! SavvyCurls.com is introducing a revolutionary way to get gorgeous, voluminous curls every morning without damaging hair by using traditional heated styling tools. 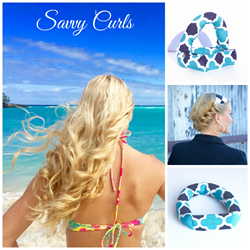 Be one of the first to get this amazing curling tool on April 29, 2016 at https://www.kickstarter.com/projects/972309897/savvy-curls-mega-glam-curling-hair-wrap as part of a Kickstarter campaign. Women are spending hours every morning curling their hair and are completely over all the uncomfortable and inconsistent overnight curlers available on the market. Or they have been avoiding overnight curling options because they’re afraid they might get that cheesy “ringlet” look from their elementary school days. The Mega Glam Single or Multi-band Thermal Curling Hair Wrap is a revolutionary way to wake up with gorgeous curls every morning, while also eliminating all that heat styling that damages hair. The product is available in two sizes: a single and multi-band wrap. The single band wrap is best for fine to medium hair between shoulder and mid-back lengths, while the multi-band wrap is best for short hair, choppy layers, or very long or thick hair. The multi-band wrap can also be used to create cascading curls that start higher on the head. Both wraps can be used to create tighter or looser curls. The thermal insulation and curl-forming materials inside the wrap use the head’s natural heat to produce beautiful, full curls that will last all day while still maintaining healthy hair. The wraps are even comfortable to sleep in, making waking up to gorgeous curls a breeze. Ultra-voluminous, maxed out curls are in, and can take hair from blah to amazing in an instant. Women everywhere are tired of spending all that time and effort to curl their hair, damaging it with heat tools, and investing in all the different size curling irons, waves, and wands needed to create the perfect style. The Mega Glam Thermal Curling Hair Wrap helps women easily achieve their desired style in an easy and comfortable fashion. SavvyCurls.com was created by cosmetologist Tami Van Der Veur who needed a better way to get beautiful, curly hair without the damage of traditional heat styling tools. After trying dozens of products available on the market, she developed a product that uses the head’s natural heat to create long-lasting curls overnight during sleep. They’re comfortable and the best part is they won’t damage hair like hot curling irons, waves, and wands. Visit http://www.savvycurls.com today for more information on the Kickstarter campaign, or to purchase the Mega Glam Thermal Curling Hair Wrap and view simple tutorials on how to get gorgeous curls.